Until the mid-19th century dental cavities were prepared very slowly. Long, slender burs were often simply twirled between finger and thumb to remove decay. Or they could be spun around with a vigorous back and forth sawing motion on a small bow. The tedious nuisance of excavation provoked shortcuts. Holes were sometimes filled with just a shrug and a plug of lead or gutta percha, skipping the caries removal altogether. The promise of speed focused both professional and public attention on the drill. James Morrison took out patents for a dental engine powered by a foot treadle in 1872. (An electric engine had been introduced in 1868, but it failed commercially, since few offices had electricity.) Morrison’s system of pulleys was adapted for drills right up to the end of World War II. The dental engine made the drill the workhorse of dentistry. Operative procedures instead of extractions became bread and butter dentistry. Nevertheless, even with the improved technology, the handpiece was known for its memorable vibrations. The problem was that the average belt-driven, gear angle handpiece in 1938 rumbled along at a speed of only 2000 rpm. After the war, better cutting diamond and tungsten-carbine burs came into wider use, which in turn encouraged higher motor speeds. 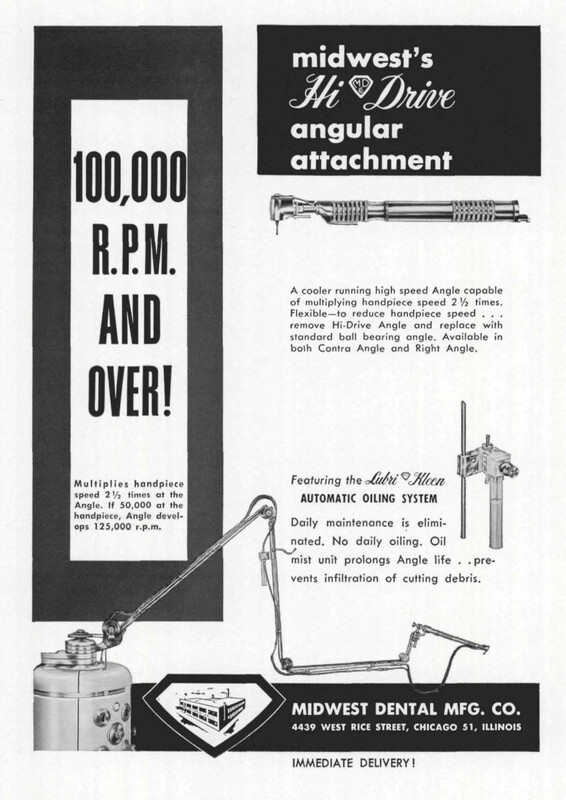 By 1950, 6500 rpm was the standard for dental handpieces. Then airplane designers noticed the windmill. The turbines that boosted jets up to mach speeds did the same for dental drills. A burst of handpiece design ideas and patents, improving mechanics and increasing speed, emerged during the decade of the 1950s. In 1957, Washington DC dentist John Borden filed a patent for a practical air turbine handpiece, called the Airotor, which, with bur speeds of 250,000, utterly changed the pace of the profession. Curtis, EK 1995 A Century of Smiles. University of the Pacific School of Dentistry; Dugoni, AA 1959 Philosophy of high-speed teaching for undergraduates. Contact Point 38(2):34-35, 39-40; Flatland, L 1988 Descriptions for Evolution in Hand, UOP School of Dentistry, Ward Museum exhibit; Kurtzman, GM 2005 Handpieces: the drill on high speeds. 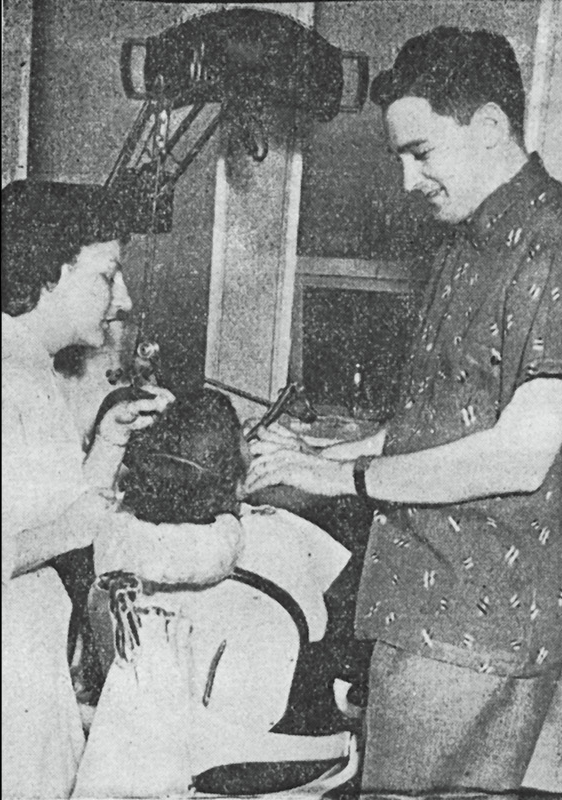 CERP 9(10):2-5; “Local Dentist Demonstrates New High Speed Drill Equipment.” S.F. Examiner April, 1957; Sockwell, CL 1963 Belt driven super speed equipment. J N Carolina Dent Soc 46:114-21; Sockwell, CL 1971 Dental handpieces and rotary cutting instruments. Dent Clin North Am 15:219-44; “SSF Dentist Displays Drill.” S.F. Examiner 2 Dec. 1956, Sec.1, p. 21; Stephens RR 1987 Dental handpiece history. Aust Dent J. 32(1):58-62; Vinski I 1979 Two hundred and fifty years of rotary instruments in dentistry. Br Dent J 146:217-23. 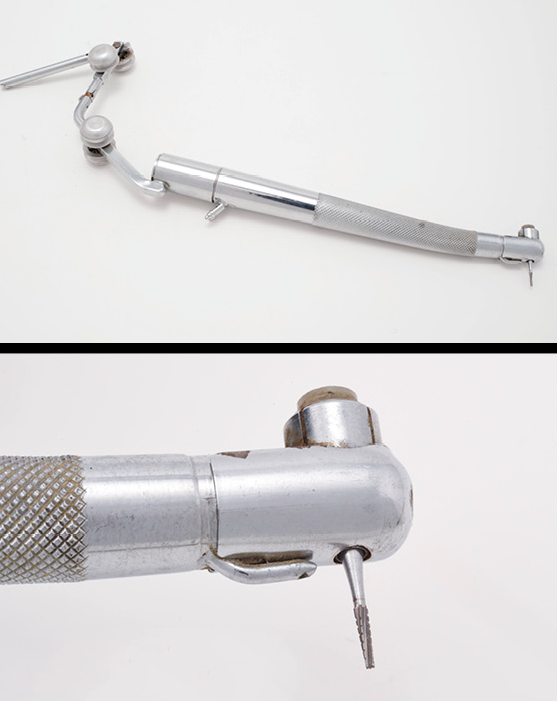 Top: Gear-driven Midwest handpiece, with contra-angle attachment, that reigned as the state-of-the-art conventional drilling instrument up to and throughout most of the 1950s. Middle: Powered by the electric dental engine, a cord belt passed through shoulder, elbow and wrist joint pulleys accelerating the 3/32-inch diameter latch-type carbon steel bur to rotational speeds of 6,500 rpm. Gear-driven handpieces function optimally at low speeds as their numerous parts with metal-to-metal contact become overheated at high speeds. Two 1893 patents by Mr. 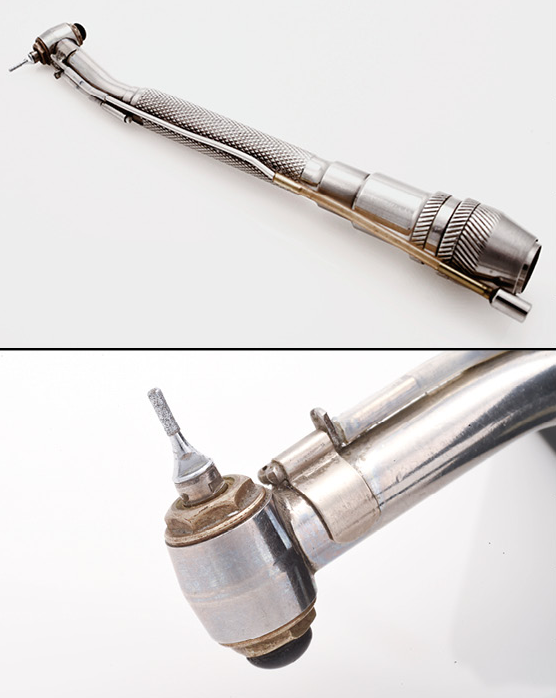 Constant Doriot, the Doriot handpiece (bottom left) and the Doriot dental engine (bottom right), provided the template for future gear-driven handpiece design improvements, including those produced by the Midwest Dental Manufacturing Company. Air-driven turbine handpiece tested and consequently rejected in favor of more conventional improvements when it was observed that the carbon steel burs used in testing failed immediately. Designed by Lloyd Flatland; developed by the Globe Electric Works in San Francisco. Water-driven turbine handpiece that produced bur speeds up to 60,000 rpm. It was the first sustainable use of the turbine principle in a handpiece. The unwieldy cord arm mechanism was absent, but it required a separate mobile cabinet to house its high-pressure pump and reservoir. A portion of the drive water recirculated and also water-cooled the tooth and bur. Diamond-cutting instruments mounted on the special screw-type shank were used. It had the highest torque of any turbine angle handpiece, and, lacking vibration, it was considered superior in this regard to all other instruments then available. Invented by Robert Nelsen in 1953; produced and marketed by Bowen & Company. Top: Pulley that used a rubber 0-Ring as a secondary belt to accelerate the belt-driven handpiece bur. 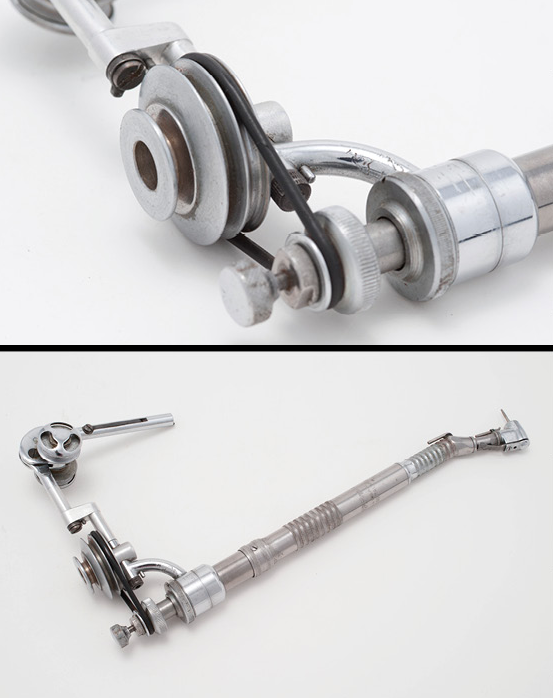 Bottom: When attached, this pulley device converted a standard straight (Doriot-type) handpiece to a higher speed unit without requiring excessive speed in the belt drive mechanism. Shown here assembled with the Midwest No. 10 and 2:1 gear ratio contra-angle attachment, it produced spindle speeds up to 50,000 rpm. Lloyd Flatland 1955 patent first developed and marketed in San Francisco by Globe Dental Company, subsequently marketed worldwide by Midwest Dental. Top: First angle handpiece that achieved bur ultra speeds above 100,000 rpm due to its gear-free double belt-driven mechanism. Within the handle sheath a secondary small internal cord and a 12 ball bearing (with factory-sealed lubrication) pulley system multiplied the motor speed. Bottom: The Page-Chayes bur type was unique but subsequently became the standard friction grip bur with a 1/16" shank used on all other types of handpieces. Although by 1960 speeds had increased to 180,000 rpm, the cord arm mechanism continued to be cumbersome. Richard Page 1955 patent marketed by the Chayes Dental Instrument Corporation. In 1956, P&S faculty members Drs. Arthur Dugoni and John Rhoads pioneered adoption of new high-speed handpieces by demonstrating use of the Page-Chayes, via closed circuit TV from the dental school's clinic, to 600 alums attending the 58th annual meeting of the Alumni Association. In their presentation they noted that, with speeds up to four times faster than conventional drills, vibration was reduced considerably. Less vibration and ease of use led to reduced pain and "bone conducted noise." These features alleviated tension, fatigue and complaints among patients, especially children. 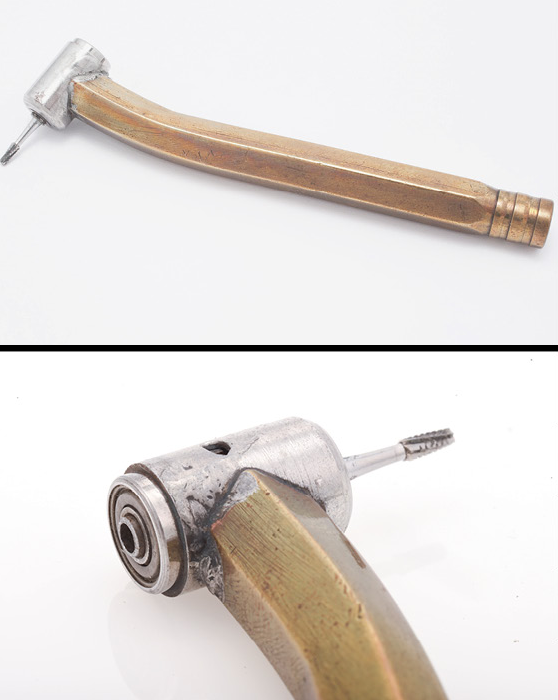 The following year, Dr. Dugoni, then an assistant professor of operative dentistry, continued to promote use of the high-speed handpiece in his essay delivered at the 137th annual scientific meeting of the CDA: "They have ushered in a completely new era of patient comfort due to the elimination of vibration. Used with a minimum of pressure and a brush-like motion, the patient is unable to perceive the cutting action due to the fact that the vibration produced is above the patient's threshold of vibration perception." Top: A single belt-driven contra-angle handpiece that drove latch-type burs at speeds up to 100,000 rpm. A thin cord belt ran from the motor pulley over the belt-arm and through the handpiece to the bur. 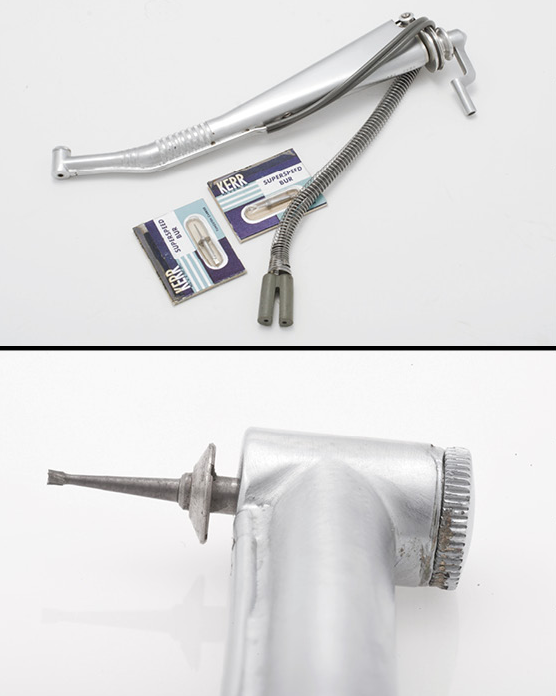 Bottom: It had both water- and air-cooling capabilities and was the first high-speed handpiece to provide a "push-button" release mechanism for changing the bur. Lloyd Flatland 1957 patent; developed by Globe Dental Company and marketed in US by Surgident Ltd.
Vacuum-driven turbine handpiece that produced speeds of 300,000 rpm and aspirated cuttings through the head into a collector. It functioned well with a dry (air coolant) cutting system, but operating procedures were insufficient under wet (water coolant) conditions. 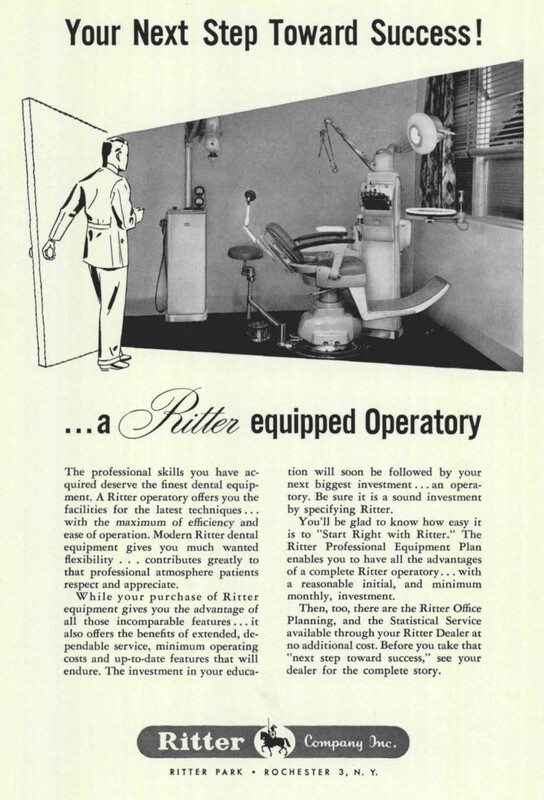 Developed by Globe Dental, licensed to Ritter Dental Mfg Company, but Ritter declined to produce it. 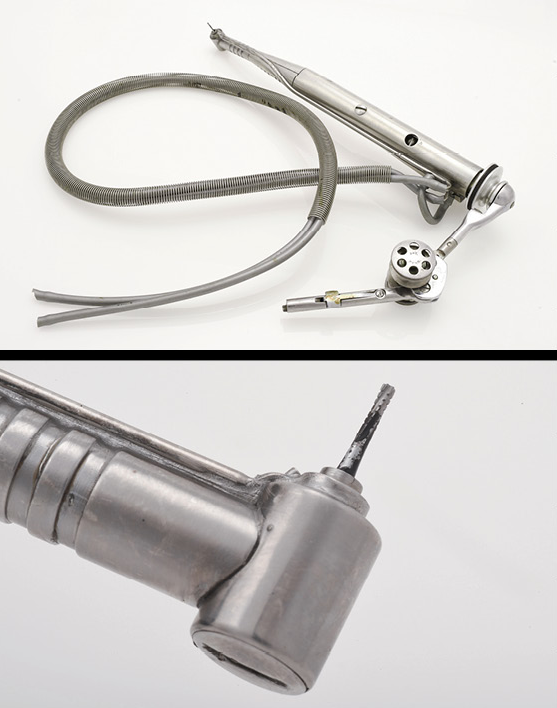 Top and middle: Two forms of self-contained electric motor contra-angle handpiece attachment used with standard belt-driven Doriot handpieces and separable handpiece wrist-joints, that had a small internal rubber belt system. They used friction grip burs and produced speeds up to 150,000 rpm. External tubing conducted air and water coolant. 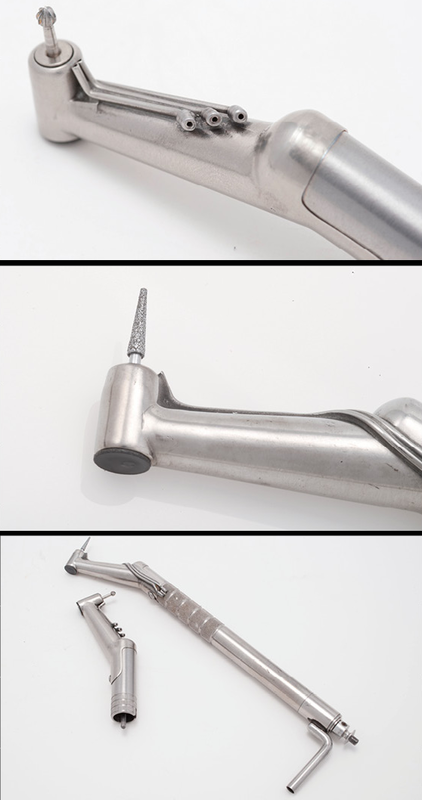 Bottom: The 212 (attached to handle) was used extensively by College of Physicians and Surgeons dental students in the early days of high-speed operation. Developed and marketed by Globe Dental, San Francisco. 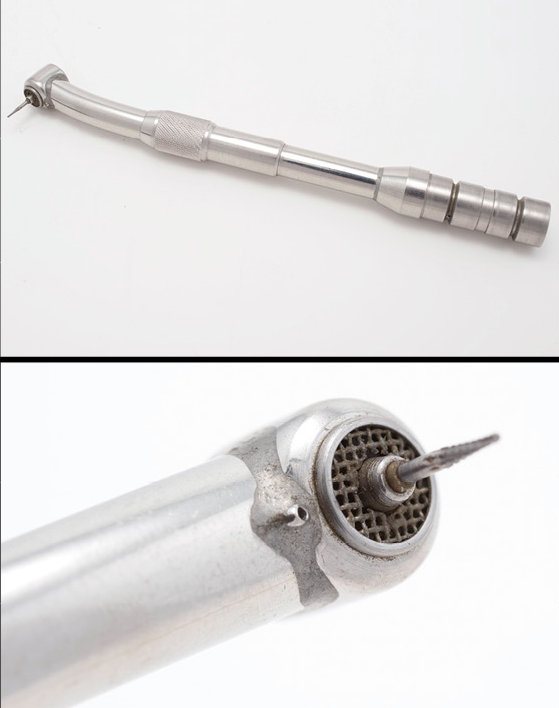 Top: Although similar achievements were being made in New Zealand and Sweden, the American-made Borden Airotor handpiece was the first perfected and commercially-viable turbine air-driven handpiece, and the prime forerunner of today's ultra speed air turbine handpieces. The two patents at the bottom show internal air and water inlets (left) and turbine design (right). Improvements included an internal water jet cooling system (small tube in middle photo) and oil-mist bearing lubricator. Its running bur (bottom photo) speed reached an unprecedented 250,000 rpm, but, due to the low-torque nature of air turbines, it slowed to approximately 150,000 rpm during operation. Ultra speed demanded finesse, but its low resistance to excessive pressure provided an excellent bur safety feature. With this handpiece, the dentist's overall cutting efficiency increased by a factor of ten and “sit-down” dentistry emerged. Dr. John Borden 1957 patent manufactured by Dentsply and marketed by Ritter and SS White. 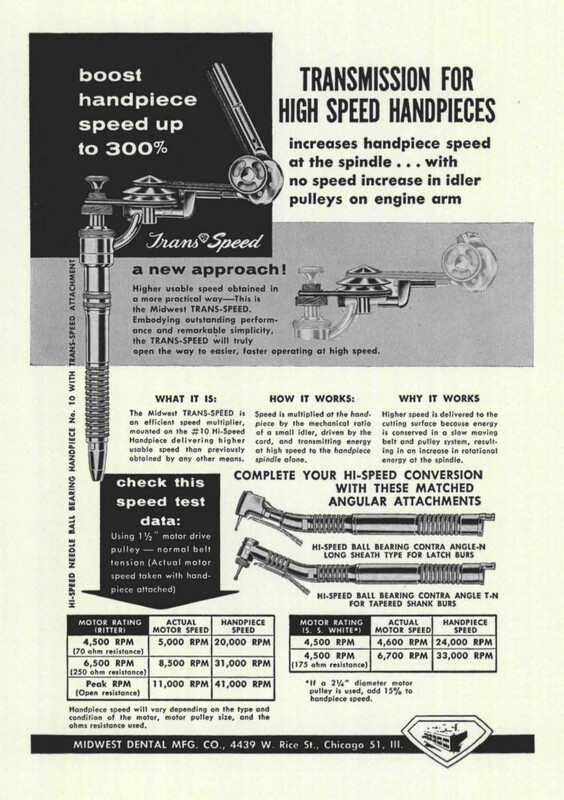 Top: Nearly identical to the 1956 cord-driven Page-Chayes handpiece in function and appearance, the Kerr Superspeed was used for operations requiring speeds between 20,000 and 150,000 rpm. A spring lock in a metal chuck held special cutting instruments that provided greater tactile sense. Bottom: A ring on the bur shank spun off moisture and debris by centrifugal force, helping prevent contamination of the head bearings. The original model had head and cutting instrument design flaws that limited access to some areas of the mouth. Manufactured and distributed by Kerr Mfg Company. 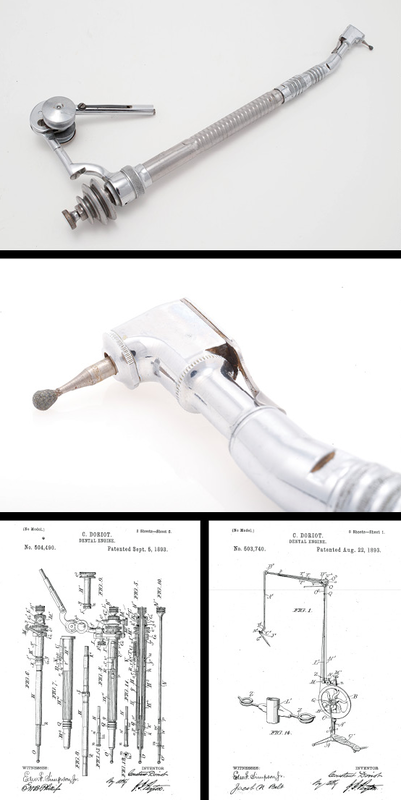 In 1959, Dr. Arthur Dugoni (top) discussed research in progress at P&S on a variety of air turbine high-speed handpieces, including one of the early prototypes, the Aero-Turbex (middle) manufactured by Densco, that had a smaller head but larger base than the Borden Airotor (bottom photos). At that time, students were used to 45,000 rpm handpieces in clinic, being introduced to the faster air turbines only in lectures and demos. They had yet to experience using these low-vibration, gentle-pressure cutting devices on patients. But a shift in the Operatory curriculum, expanding the junior amalgam clinic to include senior techniques, gave seniors time to become acquainted with characteristics of the ultra-speed air turbines. Initially practicing on full arch-mounted extracted teeth, under close instructor supervision, students redeveloped tactile sense pertinent to the increased cutting efficiency of the instrument. Seven concepts were presented to help students grasp treatment planning modifications and master new skills in response to these revolutionary changes. With running speeds upwards of 300,000 rpm attainable and the awkward belt delivery system obsolete, P&S students, as budding practitioners, and their clinic patients could enjoy heightened treatment satisfaction through previously unachievable levels of operatory comfort. Today’s high-speed handpieces reach running speeds of between 250,000 and 450,000 rpm for air-driven and around 200,000 rpm for electric-driven. Electric are beginning to replace air high speeds as the preferred instrument for maintaining a smooth and constant cutting power with reduced noise and vibration. Whereas air turbines typically lose 40 percent of their running speed when the bur makes contact with the tooth, the electric turbine does not vary as the bur meets resistance. The stable speed and torque of the electric handpiece make removal of demanding crown, bridge and restorations less difficult. In addition, the electric handpiece produces less noise and vibration, features of benefit to both patient and dentist. In response to these advantages, students at Pacific Dugoni are transitioning away from using the StarDental air-driven handpiece (bottom) and adapting to using the KaVo electric handpiece (top) in Clinic. 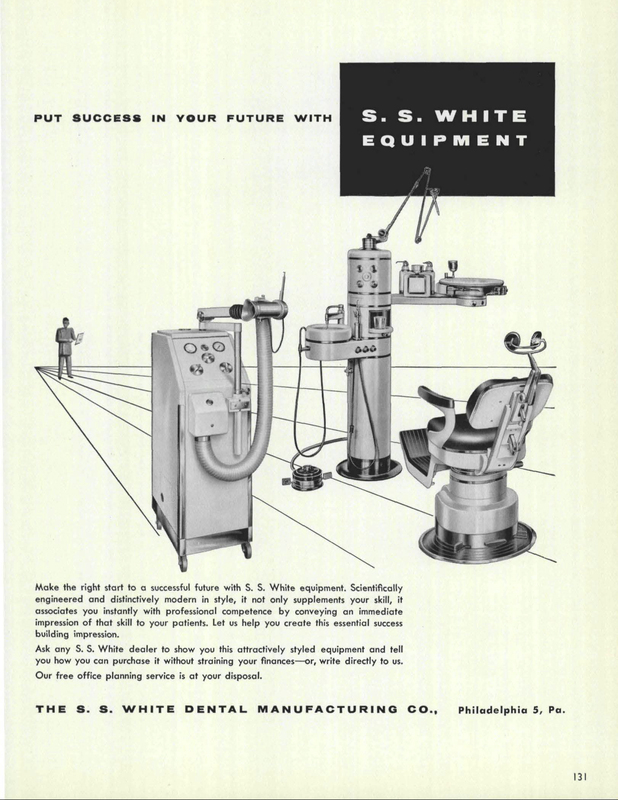 Midwest Dental's 1954 ad in the CHIPS yearbook. 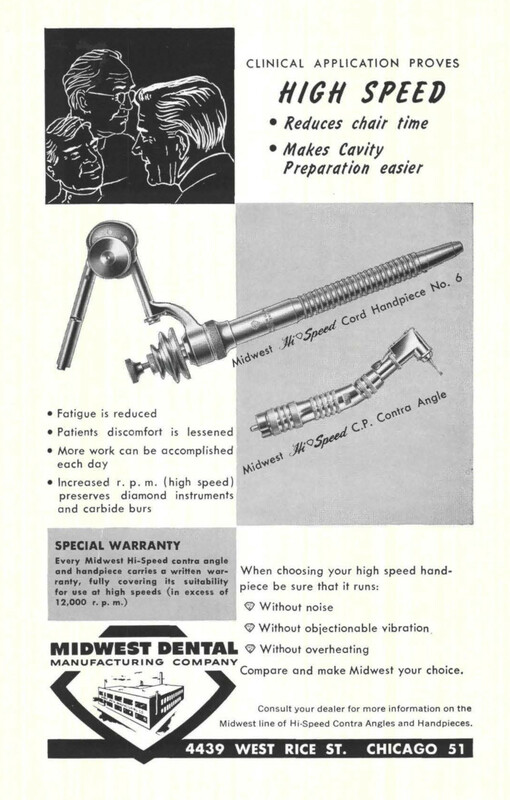 1955 ad for Midwest Dental's high-speed handpiece from the CHIPS yearbook. 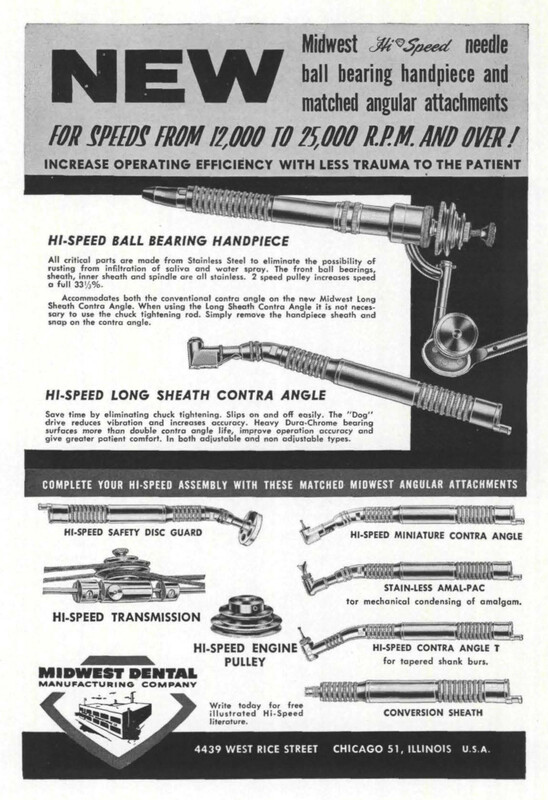 1956 ad for Midwest Dental’s TRANS SPEED pulley and handpiece attachments from the CHIPS yearbook. 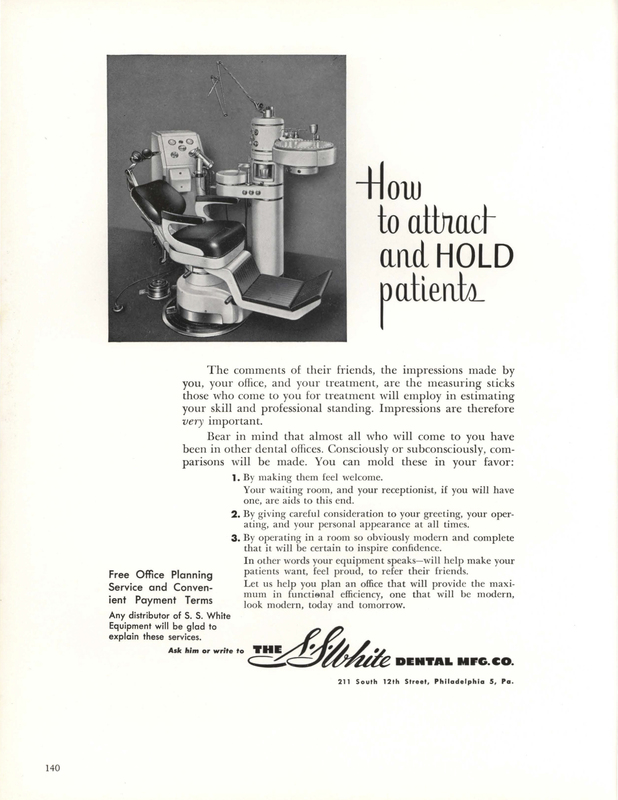 1957 ad for Midwest Dental’s ball-bearing high-speed handpiece attachment from the CHIPS yearbook. 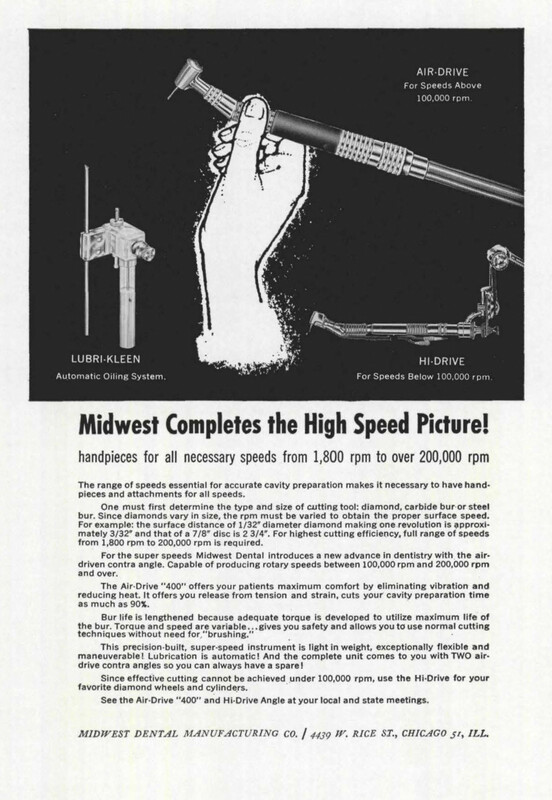 “Midwest completes the High Speed Picture,” offering the Hi-Drive (<100,000 rpm) and Air-Drive “400” (>100,000 rpm) handpieces for the various tasks required to make accurate cavity preparations, 1958 Midwest Dental ad from the CHIPS yearbook. 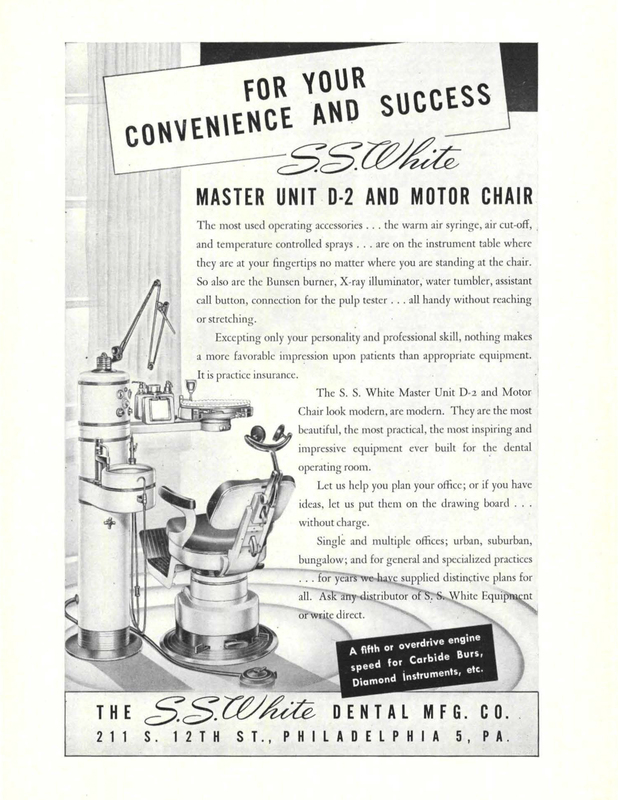 "For Your Convenience and Success," Master Unit D-2 and Motor Chair, 1950 SS White ad from the CHIPS yearbook. 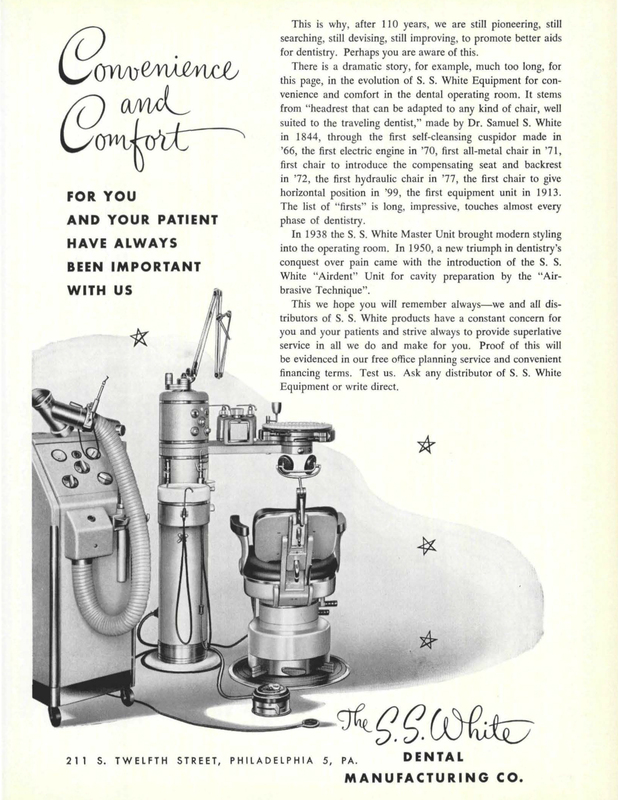 "How to attract and hold patients," 1950 SS White ad from the CHIPS yearbook. 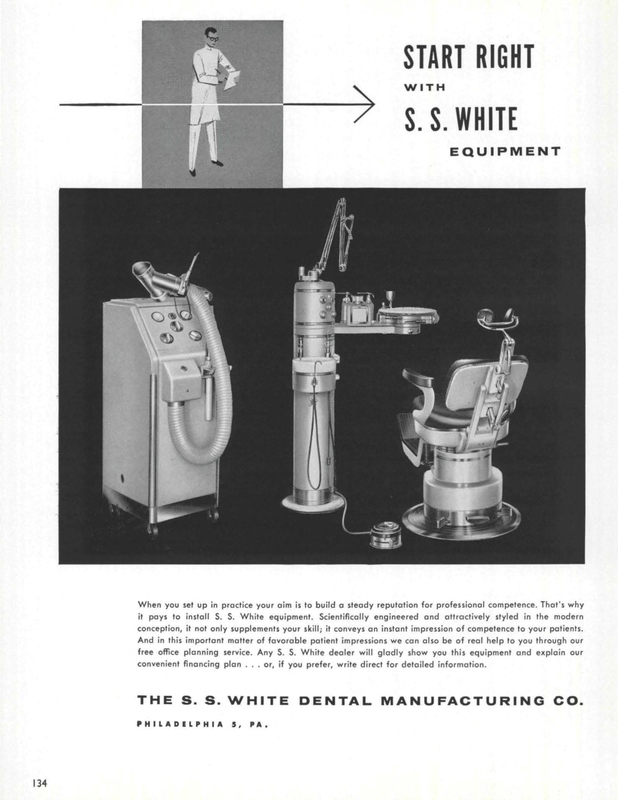 "Airdent" Unit, 1953 SS White ad from the CHIPS yearbook. "Convenience and Comfort," 1954 SS White ad from the CHIPS yearbook. 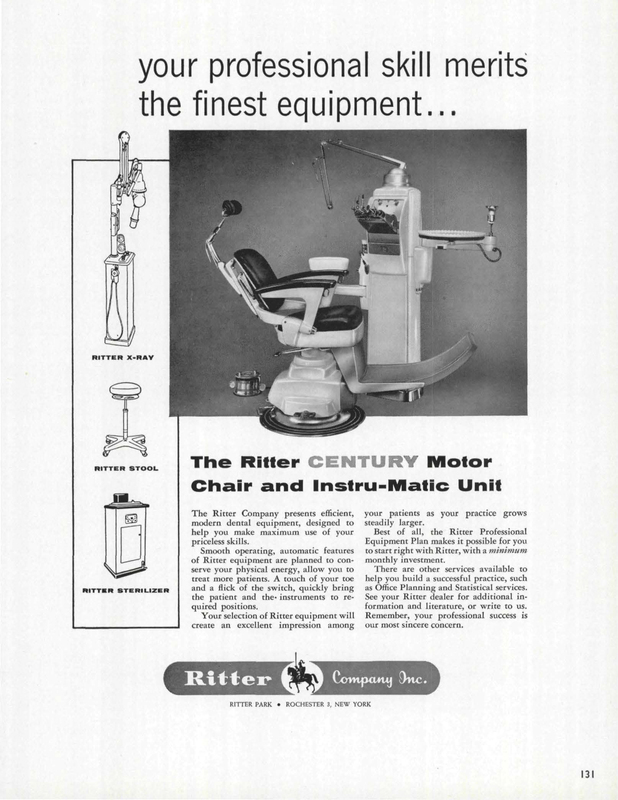 Ritter Century Motor Chair and Instru-Matic Unit, 1955 Ritter Company ad from the CHIPS yearbook. 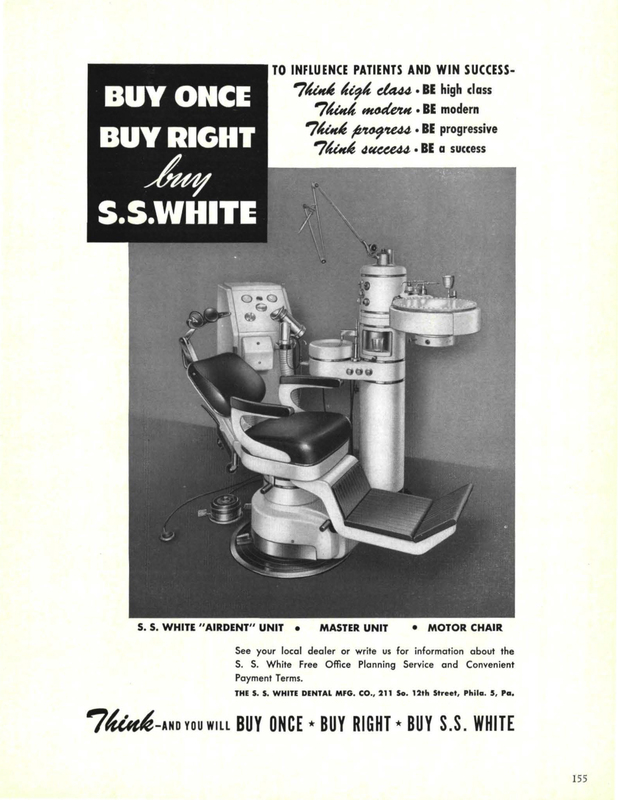 "Attractively styled in the modern conception," 1955 SS White ad from the CHIPS yearbook. "Your Next Step Toward Success!" 1956 Ritter Company ad from the CHIPS yearbook. "Put Success in Your Future," 1956 SS White ad from the CHIPS yearbook.